When my husband and I were newly married, we didn’t have much money, but it didn’t matter because our favorite thing to do was just spend time together. Of course, life and kids happened and while it is wonderful, it does make it a little tougher to spend quality time alone. We’ve been working on ways to rekindle that early dating spontaneity and find fun, creative, and even unusual date ideas to try (and not just on Valentine’s Day or other special occasions!). Experts say that weekly date nights help couples have more intimate and lasting relationships. I’m lucky to have a romantic and adventurous husband (he’s Italian) who helps break the “dinner and a movie” routine and try new things. Maybe one of these ideas will sound like something you’d like to try! Pre-kids, when we wanted to go on a date, we would just go. Usually it was something free or very inexpensive because we were on such a tight budget, but even a walk at the park or a picnic was great. Remind kids to clean rooms, do chores, etc. This of course isn’t to say that it isn’t worth it to get out kid-free once in a while, but if staying in for a date is more practical, the good news is there are still ways to make it special (and without doing the same old thing). The cost to go on a date has changed a lot too over the years! It used to cost $0-$10 to go out with my husband because we would go for a walk or hike, or to a free event at a local outdoor theater. If we were really splurging, we would go to a bar for drinks, dinner, and a movie. Now, a babysitter usually costs at least $40+ for an evening, a nice-ish dinner is easily $50+, and if we went to a movie that is another $22. $112 for a basic dinner and a movie seems like a lot, especially since it can be hard to find healthy, real food options and my husband prefers to watch movies at home. We decided long ago that we would make weekly date nights a priority, but also that many of these date nights would happen at home after the kids were in bed (cheaper, easier, and not a problem if we fall asleep by 10 PM). Over the years, I’ve developed a list of some of our favorite at-home date ideas. We’ve found that even if we are just spending uninterrupted time together after the kids go to bed but are intentionally not on our phones or laptops, we have a great time and can rekindle some of that fun, quality time spontaneity and romance of our early dating and married years. The whole lots-of-babies-in-8-years has made me a big fan of getting a massage. Pregnancy, nursing, and now carrying around toddlers are a big demand on the body and every mom could use a good massage. Unfortunately, a good 60-minute massage can cost at least $80 in most locations. While there are some great massage devices to use at home (this is my favorite), a much more romantic way is to try an at-home massage course. This Melt Massage for Couples course is taught by a husband and wife team in a really easy-to-learn format. It’s the gift that keeps on giving, now that we both actually know how to give a good massage! You might think my husband would have to con me into this one, but watching a sporting event is one date night we both enjoy equally. We share favorite baseball and football teams and have weekly dates to watch games. For big anniversaries or birthdays, I’ll try to work out getting actual tickets to a game so we can go together. If you don’t already have a chessboard and set, you can pick up an inexpensive one and learn to play together. It’s fun and great for your mind, and also a great game to teach your kids! We built a fire pit in our backyard and some of our favorite at-home dates involve sitting by the fire, sipping wine, and just talking. Lights aren’t just for Christmas … hang a string or make these homemade tiki-torches to create a romantic and cozy backyard atmosphere. There are literally hundreds of options depending on what type of documentaries you like. These require a babysitter or leaving home unless you happen to live on a lot of land, but spending time outdoors and disconnected from technology is a great way to reconnect. Look up local parks and try a new spot you haven’t explored! Not a groundbreaking date idea, but still relaxing and cheap! We don’t watch much TV, but over the years there have been a few series that we’ve really enjoyed and that gave us an excuse for regular date nights at home. We definitely pair this idea with a nice glass of our favorite wine. Another activity that I probably enjoy more than my husband does, but cooking together can be a lot of fun, especially when trying new recipes (I might know where you can find some…) or cuisines. Pick a recipe to make together. If you have the time, pick a movie that corresponds to the cuisines and enjoy dinner and a movie. Make an Italian meal and watch an Italian movie together, or try your hand at sushi-making and watch Jiro Dreams of Sushi. Dinner is the typical date meal, but no need to leave out the others! Breakfast is a healthier (and cheaper) meal to eat out. Head to a diner or local restaurant for an early morning date, and reserve the rest of the day for some good couple time. It can also be easier to get babysitters on a Saturday morning or let your kids play at a friend’s house. This is my husband’s favorite type of date, and it fits well with our decision to stick to experiences instead of material gifts. I’ve enjoyed getting out of my comfort zone on some of our more adventurous dates. One memorable year we went scuba diving, but there are tons of possibilities! Visit an indoor rock climbing gym, go kayaking (another one of ours), race go-karts, try ice skating (not my favorite! ), or if you are really brave … try karaoke! This is a recurring date theme for us. Going out can be difficult with little ones, so plan a fun date themed around ethnic foods and enjoy it at home once the kids are in bed. Make your own sushi and eat on the floor. Make healthy Mexican food and watch a movie in Spanish. Make fondue and eat by candlelight. Whatever you choose, set the mood with music and decorations to make it fun! Even if you don’t go for ethnic foods, enjoy a late-night date at home and cook for each other! This is also a budget-friendly way to keep the romance alive. This certainly isn’t for everyone, but it usually promises to be a bonding experience and is really healthy for you too. Always fun as a family, but if you can sneak away for a night, go camping as a couple. The alone time around the campfire will give you a chance to really catch up, and the potential for unforeseen circumstances (wild animals, rain, etc.) makes it an adventure. This is a great way to get closer as a couple. Once we tried it, I wished we’d started right away as a newly married couple. Focus on a cause you both believe in and volunteer together. This is something great to do with kids too. Volunteer at a soup kitchen, raise money for a cause, or pick a service project at your church. It might make you grateful for what you have and will certainly be some quality time with your love! Another advantage … spreading the love doesn’t cost a thing! We often forget about the things that others come to our town to see. Go to a play at the community theater or check out the comedy club. Find an arboretum or botanical garden and walk around. Hit the batting cages or mini golf or even just browse the bookstore together and talk over a cup of coffee. If it is in season, visit an orchard or pick-your-own farm or take a tour of a local brewery or vineyard. Exercise can be fun as a couple! Pick a new sport to learn: tennis, racquetball, basketball, or swimming… just pick something you enjoy. For an activity, go miniature golfing, paint pottery together, take dance or painting lessons, or go bike riding or canoeing. These are often the best times to talk and you get the chance to develop a new hobby or skill. Feel a little funny staring into each other’s eyes? Painting a portrait is the perfect excuse! Reconnect in an unusual way by reviving or learning a new skill. Lots of laughs will be had, I promise! It’s ok to just have fun with it, but I also recommend an online class from Udemy if you really want to learn some new skills. Dim the lights, light some beeswax candles, turn on some relaxing music, and just hang out together. Talk, sleep, cuddle, laugh… just like the old days! Making time to spend as a couple can be much more challenging than it should be, especially with kids. Make the decision to make your relationship a priority. Take the time to brainstorm new date ideas and make them happen… no need to wait for a time like Valentine’s Day to have an excuse to spend time together! What was your best (or worst) date ever? 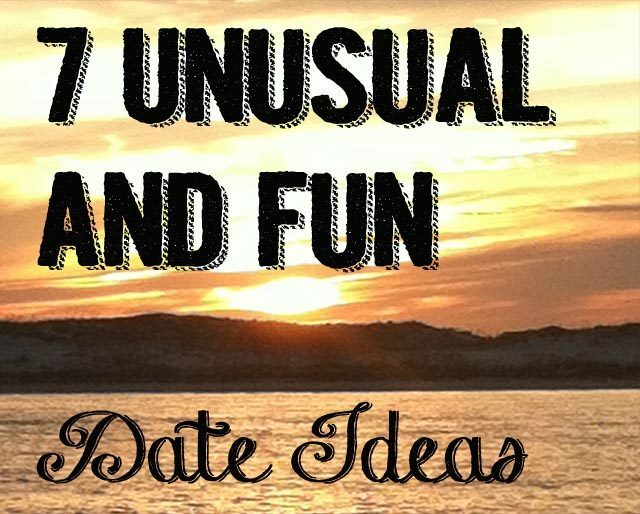 Would you try any of the date ideas above?